On its debut album, Desperate Youth, Blood Thirsty Babes, TV On The Radio yanked shapeless noise from the basements of Brooklyn and catapulted it towards the cosmos. It’s a loud blast of art-rock and cerebral funk delivered in a shape similar to the charming, precocious six-string indie songs bubbling up toward the mainstream in 2004. TV On The Radio established its distinctive edge and adventurous pop voice early on, and part of it was due to making a racket: Desperate Youth, Blood Thirsty Babes opens with “The Wrong Way,” an examination of black life in America, stoked by waves of distortion and blaring, slightly discordant horns. But the most striking track on the whole album happens to be its starkest. “Ambulance,” an a cappella love song, is TV On The Radio’s biggest risk on the album. The song follows “King Eternal,” a rhapsodic blast of shoegaze art-funk cut with high-pitched curses and a robotic drum loop that punctures the air like a nail gun—it’s loud, for sure, but not quite as piercing as the silence between syllables on “Ambulance.” While TV On The Radio uses guitars to produce all matters of mutated, graceful sounds for eight of the nine songs on Desperate Youth, Blood Thirsty Babes, the band abandons axes and all other noise-making devices for the track that leaves the biggest mark. “Ambulance” is the center of gravity, and its placement in the middle of the album is no accident. “Ambulance” is a love song, one of the best of the ’00s, and that’s largely because TV On The Radio made it a cappella. The song is about an overpowering type of love that swallows people whole and leads them to make grand, sweeping proclamations that their undying affections will outlive the sun—it’s the kind of love that inspires loads of cheesy songs that elicit boos and barfs. 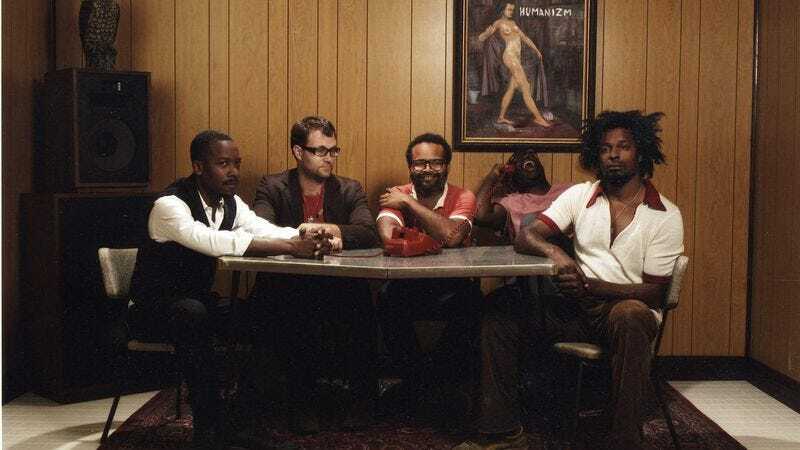 TV On The Radio succeeded in making “Ambulance” an earnest, romantic power-punch by ditching its instruments, further underscoring the idea that the only things that matter in the world are “you” and “me” by blocking out everything else. The swooning, tender vocals from Tunde Adebimpe and Kyp Malone are as mighty as they are bare, and the subtle imperfections in the performance bolster the emotional resonance of the message of love: It’s easy to believe in this song when Adebimpe and Malone expose their weaknesses to get the word out. The words in “Ambulance” have an unshakable, poetic force. This isn’t just about the little foibles that make a person irresistible, but about wanting a mutually fulfilling relationship with the one you love. The group’s version of the clichéd “savior lover” positions a broken soul on a scale, balanced by a person who wants to provide comfort—this isn’t merely about serving the protagonist’s whims, but finding necessity in another human. One is the accident, the other is the ambulance, and each person creates a necessity for the other, and, in a way, fulfills their desires.